Will This Be the Whitest Oscars in Almost 2 Decades? One year after a groundbreaking night at the Oscars where Lupita Nyong’o won the Best Supporting Actress trophy for 12 Years a Slave and that film’s black director took home the night’s top honor, things may look very different at the Academy Awards. A consensus is forming about this year’s likely nominees now that prognosticators have already seen many of the season’s heavy hitters at film festivals, and if their projections stand, this will be the first Oscars ceremony in years without a black, Hispanic, or Asian acting nominee. 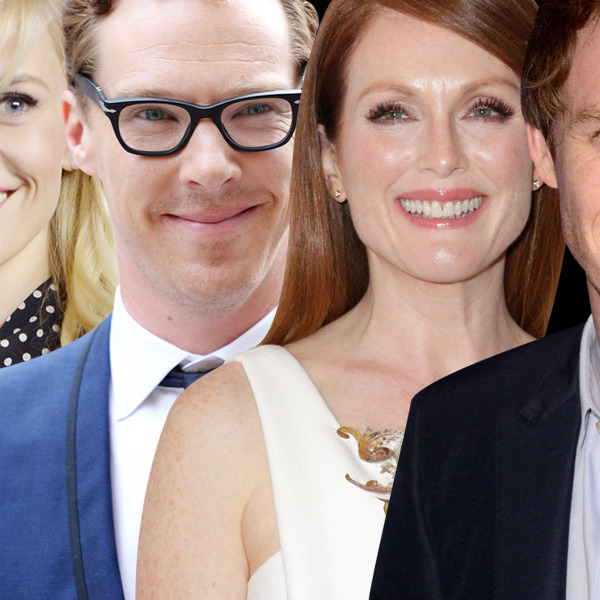 Could white actors really take home all 20 Oscar nominee slots? It seems possible if you’re going by the predictions posted at Gold Derby, where 17 of the industry’s premier Oscar prognosticators are polled. Their predictions are then shuffled together to create a shortlist ranked by odds, and so far, the top five contenders in each acting category are white. The Lead Actor category is dominated by Brits like Eddie Redmayne, Benedict Cumberbatch, and Timothy Spall; Best Actress is a panoply of pale-skinned actresses like Julianne Moore, Amy Adams, and Reese Witherspoon. White character actors over 40, like Edward Norton and J.K. Simmons, have the edge in the Best Supporting Actor category, while Best Supporting Actress is populated by front-runner Patricia Arquette and young ingenues like Emma Stone and Keira Knightley. Of the movies that have so far been seen this year featuring actors of color, only Chadwick Boseman’s sterling work in the James Brown biopic Get on Up caught the eye of the Gold Derby punditry, and even then, just one of the 17 pundits picked Boseman for his top five. (Another pundit did lay Supporting Actress odds on Iranian actress Shohreh Aghdashloo in Jon Stewart’s Rosewater, but she’s got maybe three total minutes of screen time and can’t be considered a serious contender.) The pressure, then, falls to a handful of Oscar-contending movies that have not yet screened, only two of which are known to have sizable roles for nonwhite actors. One is Angelina Jolie’s Unbroken, based on the incredible true story of WWII prisoner of war Louis Zamperini (played by Jack O’Connell, another Brit contending for Best Actor). Captured by the Japanese Navy, Zamperini was tortured by a guard he dubbed “The Bird,” who’s played in Jolie’s film by the Japanese singer Miyavi, making his American acting debut. The Bird is a juicy, antagonistic part and superficially similar to the sort of thing that won Captain Phillips newcomer Barkhad Abdi an Oscar nomination last year. Sixteen of Gold Derby’s 17 pundits expect Unbroken will score a Best Picture nomination, but only one of them predicts that Miyavi will earn one, too. The biggest potential game changer is Selma, arriving this Christmas. On paper, this is a serious Oscar contender: It’s a movie about Martin Luther King Jr. (played by David Oyelowo), directed by a talented up-and-comer (Ava DuVernay, who helmed the acclaimed indie Middle of Nowhere), shot by a tremendous cinematographer (Bradford Young), and blessed with a sterling team of producers that includes Brad Pitt and Dede Gardner (who just took home Oscars for producing 12 Years a Slave) as well as Oprah Winfrey, who also plays a supporting role in the film. That’s a whole lot of heft. Still, even with those bona fides, only a third of the Oscar pundits on Gold Derby expect Selma to land a Best Picture nod at this point. Even fewer — four — predict that Oyelowo will penetrate the packed Best Actor lineup, while Carmen Ejogo, who plays Coretta Scott King, didn’t make anyone’s list of predictions at all. I hope that’s simply because there’s been no trailer or significant promotional push yet for Selma, which just wrapped in July and will hustle to meet its Christmas release date. When I asked one pundit why the film had been short-changed so far, he wondered out loud whether it would be ready in time for awards season, but the fact that DuVernay just showed off two key scenes at the Urbanworld Film Festival implies that the marketing campaign is about to begin. Aside from those two movies, there ain’t much. Annie is led by one black Oscar winner (Jamie Foxx) and one black Oscar nominee (Quvenzhané Wallis) but is expected to be a Golden Globes play, if that. A Most Violent Year stars Hispanic actor Oscar Isaac and also features Oyelowo in a supporting role; still, the only two actors from that film who have rated with Gold Derby’s pundits are Jessica Chastain and Albert Brooks. And while Fox may position the Egypt-set Exodus: Gods and Kings as an Oscar contender, director Ridley Scott controversially cast white actors in all of the Biblical epic’s key roles. To be sure, there will be more diversity behind the scenes, where Hispanic talents like Alejandro González Iñárritu and Emmanuel Lubezki are heavily tipped to land Academy Award nominations for directing and shooting Birdman, respectively. But it’s still notable that after nearly two decades of inclusion, where nearly every year featured multiple nominees of color, the Oscar cupboard could soon be bare for nonwhite actors. It’s also a reminder that Hollywood has much further to go when it comes to nurturing diversity: In 2011, actors like Viola Davis, Octavia Spencer, and Demian Bichir were nominated for Oscars, an honor that’s supposed to portend big things to come in this industry. Three years later, all of them are doing TV. Will This Be the Whitest Oscars in Years?